Closer to home, Canadian human rights advocate Rod Vienneau told Freedom that Heinz Lehmann, Ewen Cameron and other prominent psychiatrists performed numerous experiments on normal children held at various orphanages in Quebec from the 1940s through the 1960s. 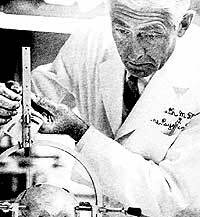 The New Orleans experiments, according to Bailey, included implanting electrodes in cat and human brains. EWEN CAMERON, HEINZ LEHMANN and other psychiatrists reportedly performed drug and psychosurgery experiments on normal children at Quebec orphanages in which many died. “In New Orleans, where it was cheaper to use Niggers than cats, because they were everywhere, and [they were] cheap experimental animals — they started to use them, Negroes and patients in hospitals....” Thus did HARRY BAILEY describe experiments by his fellow psychiatrist, ROBERT HEATH. 1 Patricia Forestier, “Psychiatric Genocide, ‘Ethnic Cleansing’ in Bosnia,” Freedom, May 1993.